In order to better understand holiness doctrine it is helpful first to understand how sin is defined in the Wesleyan tradition. Sin, per Wesley, is a willful violation of a known law of God. This is confirmed in James 4:17. Sin, properly so called, per Wesley, is not honest mistakes, misunderstandings, or shortcomings. It involves an act of the will. The following diagram will help to clarify this (from: Leslie D. Wilcox volume 3 of his Profiles in Wesleyan Theology). According to Wesley's definition he did not (in the sense of an act of rebellion), for it did not carry the essential elements. First, he did not know he was doing wrong. Secondly, he did not willfully violate his neighbor, but yet, to all rights and appearances, the new neighbor broke the law and stole what was rightfully his neighbor’s. Now, once he was informed of the fact that he violated the law, and then he owed his neighbor restitution for his loss. Yes! Sin is a matter of the heart and intent, not necessarily the result of what occurred. If he thought that he was stealing his neighbor’s pears, he was committing a sin in his own heart, a willful transgression of a known law of God. This illustration helps us to rightfully differentiate between a mistake, an act of ignorance, and a willful act of sin." In the example above it might take time and study to determine if sin had occurred. For example, a surveyor may have had to come out and survey the property. Property records might have had to be checked at the county courthouse. It may have taken time to verify the actual location of the property line. If the records were in dispute litigation may have been needed to resolve where the actual property line was. Only when both owners had agreed where the line was could they then determine who was at fault. Likewise, for Christians seeking to follow Christ, we must learn through prayer and bible study what God's will is for our lives. Once we become aware that we are falling short in some area either through sin of omission or commission we are then morally accountable for it. Even here it may take time for us to either learn to act in new ways or learn how to stop acting in old ways. Note: For a deeper understanding of the Wesleyan definition of sin (in contrast to a legal definition of sin) see this webpage. Wesleyans also do not believe that thoughts, feelings and emotions are sinful in and of themselves. We believe that emotions, thoughts and feelings are amoral (morally neutral). This is based on the fact that Jesus was tempted in every way as we are yet without sin (see Hebrews 4:15). To be tempted as we are Jesus would have experienced those temptations as thoughts and feelings that could lead to sin. Otherwise there would be no temptation. Similarly, Jesus' prayer in the Garden of Gethsemane shows some of His emotional struggle (see Luke 22:40-46). Jesus submitted to His Father's will even though His passion was so great that He sweat drops of blood. When do sinless feelings and thoughts become sinless temptations, and when do sinless temptations become sinful lust? There is a line to be crossed here but one does not cross it by just having feelings or thoughts. Thus Christians, gay or straight, are free to explore and seek to understand their emotions and thoughts without being condemned just for having them. Emotions are a barometer of the soul -- they tell us what is going on inside of us. Like Jesus, we must take care that we are not lead by our emotions but are instead led by the Holy Spirit as we commit ourselves to the will of God. Thus, Wesleyans do not believe that people sin in thought, word, and deed daily at least not in the "properly so called" sense of the word. Again, sin is a willful violation of a known law of God. The person who knows what is right to do and does not do it, sins ( James 4:17). Sinful acts: actions that are willful violation of a known law of God as shown above. The remedy for sinful acts is confession of our sins to God through Jesus Christ (see I John 1:8 -2:2.). One can only do this as one becomes aware of the areas in which they are sinning. Until then they are not accountable for them though they may suffer the natural consequences of them. Sinful nature: (also called original sin) an inborn tendency to sin passed down through all of humanity through Adam's sin. When / if the person chooses to come to faith in Christ it is called being born again or initial sanctification. At this point three things happen to the individual. They are justified, regenerated and adopted. As the new Christian seeks to grow in Christ and understand what God requires of them they will encounter moments where they must decide if they are going to continue in this new found faith or not. They will encounter moments where they may not be sure they are willing to submit to God in a particular area. At some point in their journey they will make a once for all commitment to full submission to Christ. This is called consecration. When this happens God sanctifies them (also called entire sanctification.) The word "entire" implies that they are done but this is not the case. They must still grow in Christ. They must continue to submit to Christ and grow in Christ all their life. Therefore all Christians are sanctified AND are being sanctified. The word sanctification is another form of the word for holiness (see this link). So you could also say that all Christians are holy (Heb 10:10) and are being made holy (Heb 10:14). 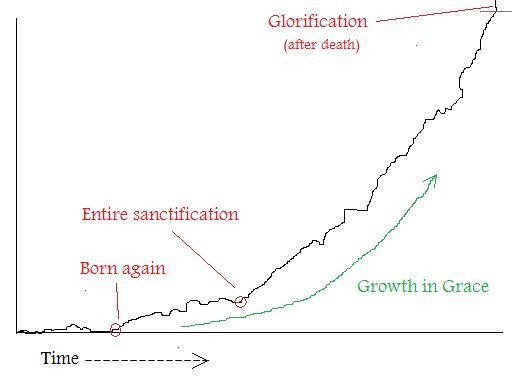 This process of ongoing growth in grace and holiness continues until death after which the believer is eventually glorified when the dead in Christ are raised. Before we come to faith in Christ, God is at work to bring us to Himself. We call this prevenient grace. When we first respond to Christ our heart is quickened to be able to comprehend our need for Christ and come to faith in Christ. This is called initial sanctification or initial holiness. As we journey in Christ learning more about following Him we will eventually come to a place where we must make a decision once for all to follow Christ. In this decision we make the conscious decision to submit completely to the will of Christ offering ourselves completely to God. As we offer ourselves completely to God (set ourselves apart for God) God sanctifies us (makes us holy) and sets us apart completely for Him. This is also called entire sanctification. For those interested in further study ... John Wesley called entire sanctification 'Christian Perfection'. You can read about this in a paper he wrote called: A Plain Account of Christian Perfection.